I made this card a few days ago, using another stamped/printed image found in my box of images. It's a Whimsy image, but I'm not sure if I stamped it or if it was a digital print. I colored it with Copics, and made the background using the herringbone technique along with some red & black dsp's and cardstock. This sad looking kitty may have been watching Grey's Anatomy last night! If you haven't seen it yet, I won't spoil it for you, but this kitty looks like I did after watching it! Ooof :( I have to keep reminding myself that it's just a tv show. Thanks for stopping by today and I wish you a great start to the weekend! 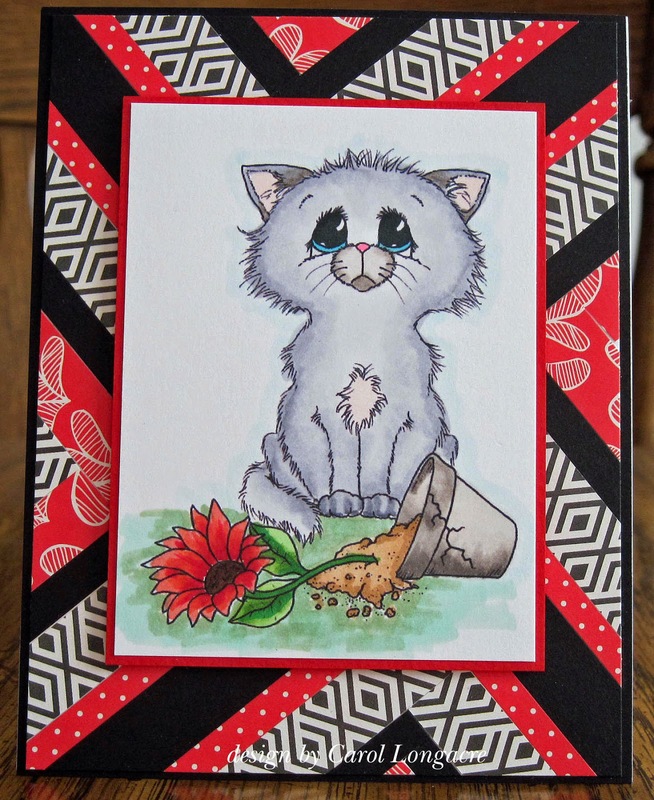 That really is a sad looking kitty but your cute card should make him happier! Love the background and that herringbone patterns and papers. Sorry about the TV show but maybe things will be better on it next week. These eyes are really impressive! I daily feed some abandoned kitten and this looking remember me them... But your card is so bright and lovely!! Beautiful colouring and fabulous use of snippets! Aw, this is so cute! Such a sad little puss! Hope your TV show gets better! We gave up TV a few years ago so I don't know about your show - it sounds good though! You were right, Carol, one show was worse than the next! This is the cutest kitty ever. Fantastic array of colors. Cute card! And I love when you make these backgrounds...always makes want to try and do another one. I could never get into Grey's Anatomy...but it was one of my Mother's favorite shows. She had a crush on MC dreamy! Maybe it's because I worked at a hospital that I could never get into it.